Below are a selection of photographs taken from the Midland Railway Society collection. If you feel you have anything to add to the captions, or that we have got our facts wrong, then please email webmaster@midlandrailwaysociety.org.uk with your comments. Guiseley station was situated on the Apperley Junction to Otley and Ilkley line (officially known as the Otley and Ilkley Extension line). An up stopping passenger train is entering the station with a horse box behind the locomotive headed by a Johnson 2–4–0 in re-built condition with Deeley chimney and smokebox door. In addition to over 30 Midland Railway train services per day in 1909, the line through Guiseley was also used by ten North Eastern passenger trains between Bradford (Market St.) and Harrogate via the circuitous route through Otley, Arthington and Pannal. 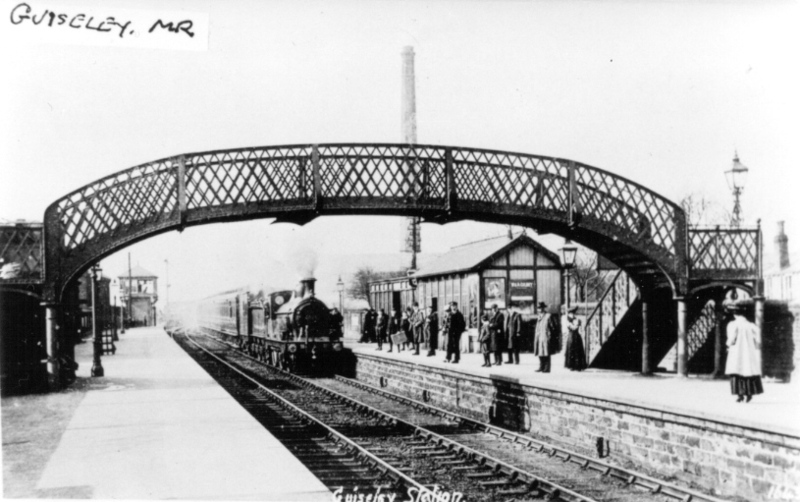 Guiseley station was opened on August 1st 1865 and was situated at the summit of the line at 443 feet above sea level. Trains faced a three-mile climb on either side with the ascent from Apperley junction being particularly steep at 1 in 60 for much of this section. The photograph is taken looking north with the new signal box, which was brought into use on March 18th 1906, situated on the down platform. A wooden station building is sited on the up platform and a typical Midland Railway footbridge dominates the scene. Guiseley acted as a focal point for goods services serving the Yeadon branch which diverged from the main line 43 chains to the south at Rawdon Junction. Your caption states that this station was the focal point for the Yeadon branch. Although I don’t dispute that it was the junction station for the Yeadon Branch, I would say that the focal point was the operating arrangements. It was where the Bradford and Leeds Down trains met and stock was exchanged for onward working to Ilkley and Otley, both trains sometimes having Ilkley and Otley portions, and vice versa for Up trains - the stations being in an ‘X layout’ with Guiseley at the crossing of the arms. Due to this there were extension platforms and sidings to both platforms. This is an arrangement I haven’t seen anywhere else in Britain - but could be wrong! Full details are in ‘The Railways of Wharfedale’ by Peter E Baughan pub. D & C. Text p.134 & 136–7, Sketch Map p.135 and Appendix 4a & b.
Heysham Harbour circa 1905 showing the extensive goods facilities constructed to deal with traffic from Northern Ireland. On the far left is the power station that provided electricity used to drive the cranes and other equipment at the harbour. Luffenham station on the Syston and Peterborough line looking towards junction with the LNWR line to Seaton Junction. The station opened for passenger traffic on May 1st 1848 while the junction with the LNWR was brought into use on June 2nd 1851. The LNWR possessed running powers over the Midland between Luffenham and Stamford for all traffic. On the far left is the exit from the up lie-by with the two running lines in the centre. Luffenham Junction signal box stands at the far end of the up platform. 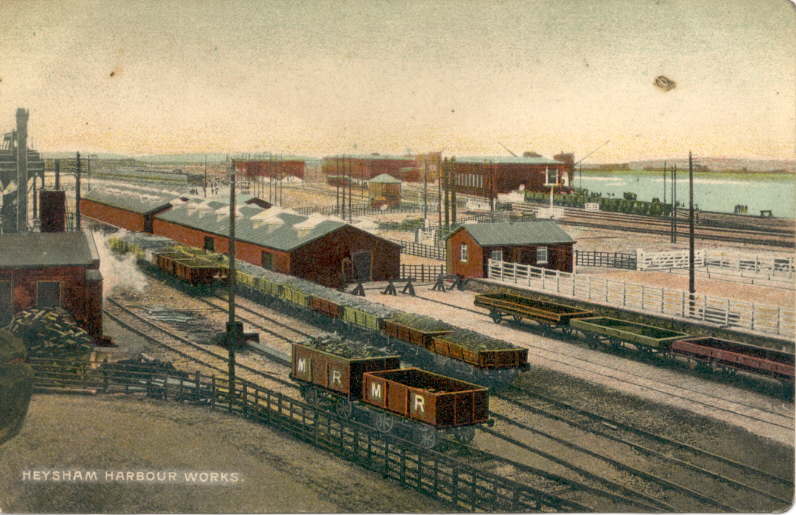 On the right is the `down platform line' with the main station building and a water crane. An impressive array of signals controls the junction and level crossing and a train is signalled into the down platform. The line through Luffenham was an important Midland artery for both passenger and goods traffic to and from the eastern counties. The main traffic was a procession of eastbound coal trains destined initially for Peterborough: for example in 1909 there were 21 of these in each 24-hour period, mainly during the evening and night. They originated from a wide variety of locations such as Coalville, Kirkby, Hasland, Toton, Stockingford and Tibshelf. In the down direction daily goods trains for Peterborough originated from Derby, Leicester and Wigston. 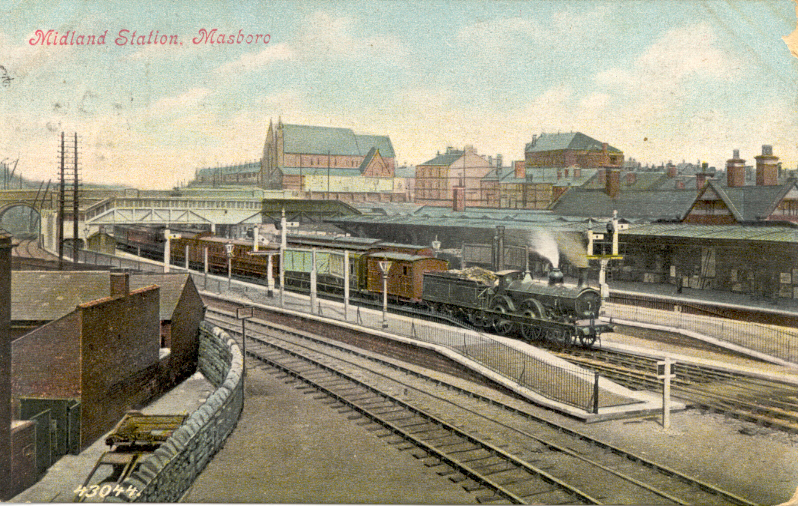 Masborough and Rotherham station circa 1900 with a Johnson 2–4–0 on an up passenger train. The station was re-named Rotherham (Masborough Station) on April 1st 1908. The signal on the down platform indicates that the train is routed round the curve to Holmes Junction and Sheffield.